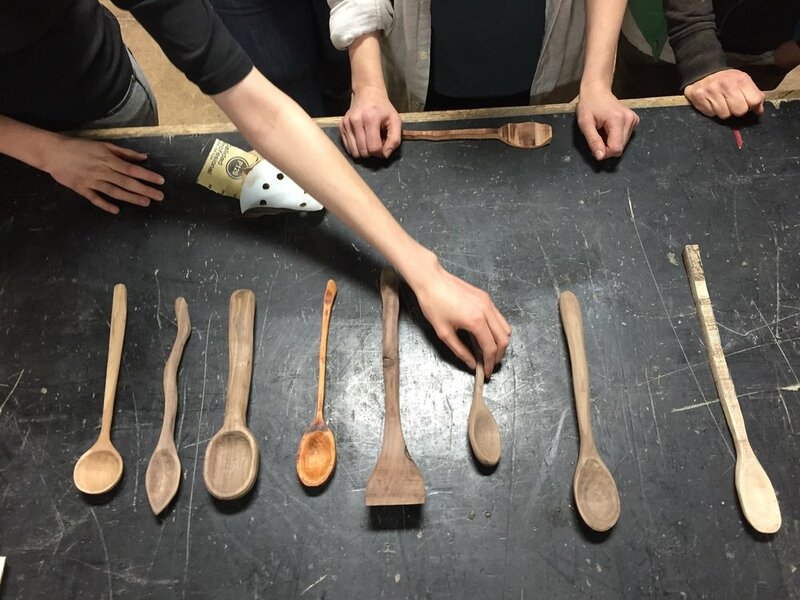 Do you and a group of friends want to learn to make together? Perhaps you'd like to infuse a little camaraderie into the workplace with a team building workshop? Check out these private workshops just for groups! Get hands on instruction with shop machinery and leave with a custom crafted serving board that YOU made! This special class is only offered to private groups and fulfills the Shop Safety prerequisite for all of our other classes*. *Participants will have fulfilled our Shop Safety prerequisite by taking any of these classes. Hooray! Can I schedule a group workshop outside of that time frame? For Team-building classes we have found that many employers give their employees 1/2 days to do team building activities. For other types of groups, we try to be flexible but are limited by the fact that we schedule the evening and weekend classes in our shop for the general public 3 months in advance. If you are willing to wait, we might be able to work it out; however, you'd really be doing us a solid by booking within the suggested time slot. This helps us to maximize the use of our space which means less money we have to fundraise each year to keep the doors open and the lights on. Great! Where do I sign us up? Fill out the form below and we'll get your booking started! Please note that we require a 50% deposit to secure your date. The deposit is only good for that date and becomes non-refundable exactly 30 days prior to your workshop date. Make it even more amazing by adding food and beverages to your event! All you do is show up and we handle the rest! Group classes and team building workshops are typically scheduled Monday through Thursday between 9am - 5pm and Fridays between 9am - 10pm. Please indicate start time. Workshops are 4 hours and must end by 5p Monday - Thursday and 10pm on Fridays. Thank you! One of our team will look over your details and get right back to you with how to proceed, and we look forward to having you! Have all your participants print and sign this form and bring to class - if they are 17 years old and younger. If you have selected to have light fare and drinks provided, please have ALL participants complete this dietary preferences survey.